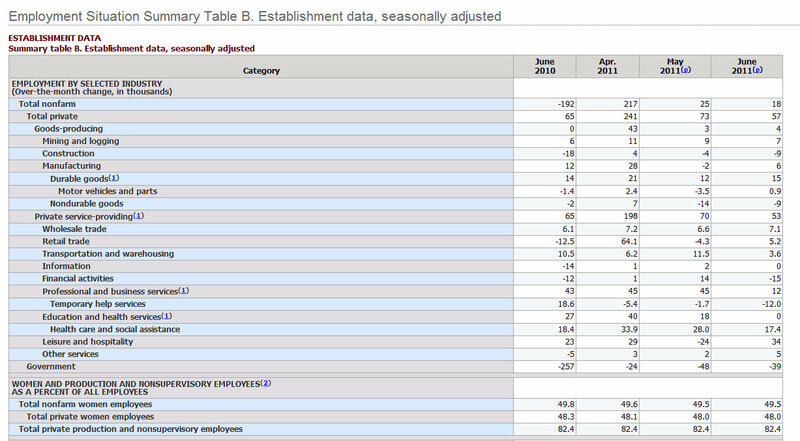 The Attack Democrat--Nothing Conservative Here: Discrepancy in Jobs Reports—Who is right, ADP or Labor Department? Discrepancy in Jobs Reports—Who is right, ADP or Labor Department? As I reported yesterday, ADP said employment in the U.S. nonfarm private business sector rose 157,000 from May to June on a seasonally adjusted basis. Analysts expected a gain of only 70,000 in June, so the ADP report was a surprise. Now we get a report today from the Bureau of Labor Statistics (BLS) of the Department of Labor saying we had a net gain of only 18,000 jobs in June after a loss of 39,000 government jobs. Labor says the private sector added only 57,000 jobs in June. WHO IS RIGHT--ADP OR BLS? Why are the ADP and Labor Department numbers so far off? If you look closely at the ADP report there is a number that is very suspicious and would account for the 100,000 difference. The largest difference---exactly 100,000—involves the Service-Providing Sector. ADP says the Service sector saw gains of 130,000, BLS has the gain at just 53,000. There are big differences in ADP and BLS numbers for Goods-Producing (ADP=+27,000, BLS=+4,000) and Manufacturing (ADP=+24,000, BLS=+6,000).